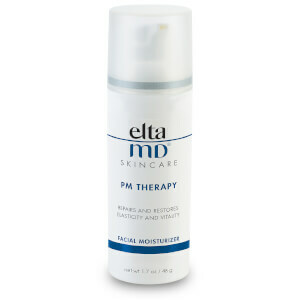 Elta MD AM Therapy Facial Moisturizer provides all-day moisturizing in a very lightweight, oil-free moisturizer base. Elta MD AM Therapy Facial Moisturizer increases moisture absorption and retention by stimulating aquaporins in skin cells. Ideal for those who want to moisturize, smooth and improve the skin's tone. Salix alba (willow) bark extract: Natural source of salicylic acid that stimulates cell turnover. Piptadenia colubrina peel extract: Stimulates aquaporin activity for moisture retention. Caffeine: Helps stimulate aquaporins to retain moisture and enhances the appearance of dry or damaged skin by reducing flaking and restoring suppleness. Sodium hyaluronate (Hyaluronic Acid): Retains moisture and improves skin feel by reducing flaking and restoring suppleness. 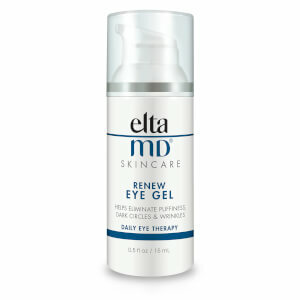 I have really fallen in love with Elta MD products! They work well with my menopausal skin and I never look dry or dehydrated. My son has an acne problem. But he still needs a moisturizer to hydrate. He likes it! It is tough to explain why I like this product so much. I have used moisturizers that feel heavy because the occlusive agents (usually oil based such as Shea Butter) seem to sit on my skin and feel like an oil slick. This moisturizer does not feel that way. It's very light, but yet my skin feels hydrated. I have this weird area on my forehead that tends to be dry- when I wear this moisturizer it feels smooth and supple. It also plays well with my sunscreen. Love it! I like this moisturizer for my oily, acne prone, but dehydrated skin. Great ingredients and doesn't irritate my skin. Not only is this light, I feel like it really does keep my skin moisturized (at least in fall weather - will see once it gets colder and drier). I also think it's improving my skin's appearance in terms of less visible fine lines and more smoothness, even at the end of the day when I figure it would have 'worn off' already. This is a light oil-free moisturizer. It is calming and helps to retain moisture. It sinks in right away & doesn't break me out. Works well under makeup. This is a great moisturizer. It is kind of siliconey, but thats fine for an AM moisturizer, because it acts like kind of a primer as well and really blurs pores. I wouldn't recommend this for night time for that same reason. But it works great, especially if your face is dry from the night before from acne treatments. It doesn't leave a film, or have a scent and it really moisturizes without being heavy or clogging your pores. It's a great price and has some stellar ingredients like niacinamide and vitamin C. I highly recommended for all skin types and conditions. This is a great light moisturizer. It's very calming and great under sunscreen or makeup. I love this moisturizer! I have normal but very sensitive skin. With moisturizers I've used in the past I've experienced irritation when I first started using them, but not this one. I found it to be very soothing and comforting from the first time I tried it. It is moisturizing, but light. It makes my skin feel soft and smooth, and seems to decrease some redness. 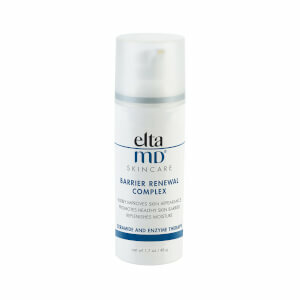 I use it before the Elta MD tinted SPF 41 and have found them to be a great combination. My skin stays comfortably matte all day without the greasiness and shine I've experienced from other moisturizer/sunscreen combinations or moisturizing sunscreens.